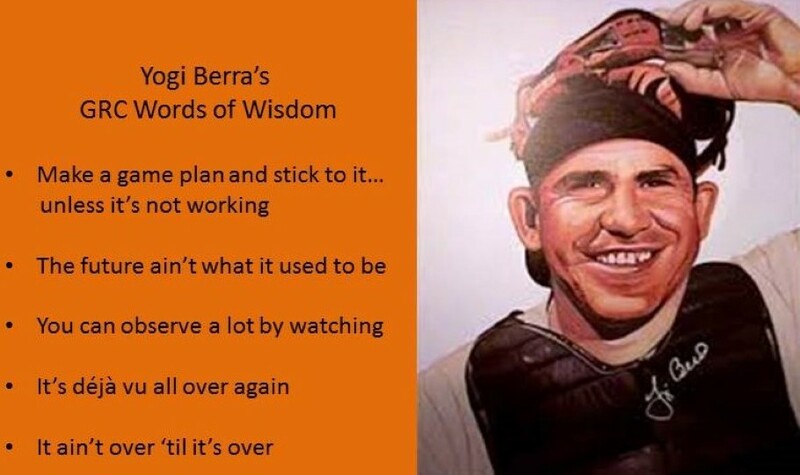 No one ever accused me of being a baseball fan, but I was a fan of the great Yogi Berra and his way with words. Today, with a sad smile and remembrance, I just want to pay tribute to the man with a nod to how some of his more memorable sayings fit so well into my world; the world of governance, risk management and compliance, or GRC. “Make a game plan and stick to it…unless it’s not working.” It sounds like a contradiction at first but it’s actually exactly right. Do your strategic planning, and then don’t just blindly follow the plan. Be prepared to take into account changing factors that might affect your success, continuously improve your plans and stay agile and ready to switch it up. “The future ain’t what it used to be.” No truer words were ever spoken. Our assessments, guesses and visions of the future business environment are almost always wrong, at least in part. Constant readjustment and vigilance to change are necessary skills in today’s world. “You can observe a lot by watching.” So this one sounds redundant, right? But really it isn’t and the difference is important. To watch means to look at something carefully, often something that is moving. But to “observe” means more, it implies noticing or perceiving something and registering it as being significant. Too often, we set up mechanisms to observe but we don’t establish means to determine the significance of what we observe — be it new threats or opportunities, possible compliance violations, or changes that demand re-evaluation of objectives or strategies. We’re taking a deeper look into that on October 1st in a free OCEG webcast. “It’s dé·jà vu all over again.” Ok, this one I’ll give you, it sounds funny. But really, don’t we experience just that feeling over and over again? We see the same mistakes, the same damage to reputation and the bottom line, the same reactions and the same failure to make the necessary improvements to culture, processes, and technologies that might help entities prevent failures and better manage risk. “It ain’t over ‘til it’s over.” Even then, you might argue, when a legacy of wisdom is left behind, it’s really never over. Thank you, Yogi, you made us smile for many, many years.